Folllowing a Freedom of Information request from Scottish CND the Ministry of Defence have released risk assessments for a major nuclear accident on the shiplift at Faslane. The heavily redacted internal reports say that the risk is "close to the tolerability criterion level". Arthur West, chair of Scottish Campaign for Nuclear Disarmament, expressed his disgust about the recent Government announcement that they are set to spend an extra £600 million on the Dreadnought submarine programme which is part of Westminster's plan to replace the Trident nuclear weapons system. "It is absolutely disgusting the Government plan to spend millions of pounds in this way, instead of spending it on decent things like schools, hospitals and building new homes. According to public sources of information, it now looks as though the replacement of Trident could cost well over £200 billion in its lifetime. This is completely unacceptable and represents a massive drain on public service budgets." Dreadnought is the British programme to replace the 4 Vanguard class submarines which provide continuous at sea deterrence since 1992, with Dreadnought submarines to be introduced from 2030's onward with a lifespan of just 30 years. Dreadnought will be based at Faslane, just 30 miles away from Glasgow and will cost over £41 billion, one of the most expensive Government projects going forward. The annual cost of the Trident system is at least £2.2 billion per year which is the equivalent to what is spent on Income Support, Statutory Maternity Pay or Carer's Allowance. To support the fight for nuclear disarmament, consider becoming a member of Scottish CND. A group of 95 scientists says the United States should significantly reduce the country's collection of nuclear weapons. The 95 National Academy of Sciences members said the current U.S. weapons stockpile was going against U.S. security. Most of the experts are from prominent U.S. universities and as a group have received 32 Nobel Prizes. The group, coordinated by the Union of Concerned Scientists, suggested that the United States cut back its arms stockpile to 1,000 explosives, compared to the 4,500 to 6,000 it has now. It also reportedly requested that the country surrender first use of the nuclear explosives. Richard Garwin, who made plans for the first hydrogen bomb, was one of the scientists to sign the proposal.. The consortium with a Â£20bn contract to clean up Britain's Sellafield nuclear plant has been handed a blank cheque by the Government to pay for future accidents there. The Nuclear Decommissioning Authority wants the Department for Business, Enterprise and Regulatory Reform to grant indemnity to Nuclear Management Partners Ltd.Â—the consortium that won PBO status in the Sellafield contractÂ—against uninsurable claims arising from a nuclear incident that fall outside the protections offered by the Nuclear Installations Act and the Paris/Brussels Conventions. Â“It would not be viable for any of the bidders to proceed without an indemnity because any fee earning benefits of the contract would be overwhelmed by the potential liabilities,Â” Energy Minister Malcolm Wicks informed the House of Commons..
Safety blunders at the nuclear bomb bases on the Clyde have rocketed to a record high, shutting down submarine reactors, spilling radioactivity and contaminating workers. An internal Ministry of Defence (MoD) report has revealed that there were exactly 100 nuclear safety lapses at Faslane and Coulport, near Helensburgh, between June 2006 and May 2007. This was 40% higher than the previous year and nearly three times higher than in 2000-01. Safety at the bases - home to the UK's Trident nuclear weapons system - has been condemned as "an absolute disgrace" by the Scottish National Party. The MoD, however, insisted that safety standards were improving. The MoD's latest annual review of "nuclear safety events" at the bases included dropping a reactor control rod, breaching reactor containment and 32 power failures. 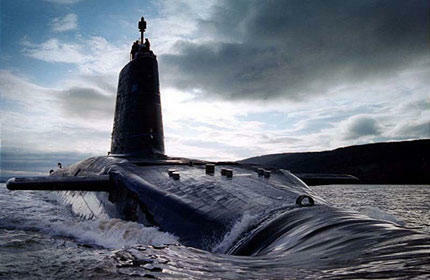 Two of the most serious incidents occurred on Trident submarines in September and December 2006. In both cases, radioactive cooling water spilled from a faulty hose pipe. On one occasion it contaminated a worker's shoe. The second of the incidents was categorised as having had "high potential for actual radioactive release to the environment". The first, along with 19 other incidents, was defined as having had "actual or potential for a contained release within building or submarine".